“This, however, does not mean that he, as the nation's leader, will decline courtesy calls or offers of support from citizens including candidates flying the flags of other parties. NAN reports that prior to Sunday's meeting with the president, Amosun, accompanied by the APM National Chairman, Alhaji Yusuf Dantalle, had in Dec. 2018, met with the president at the Presidential Villa, Abuja. Amosun, at the meeting, presented a letter of adoption of the President by APM as the party's presidential candidate in Feb. 16 general elections. 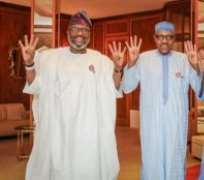 NAN reports that the President and his visitors, at the end of today's visit, had group photograph where they all demonstrated the “4 + 4'' symbol with their fingers, meaning another four years for governing APC in Presidential Villa. Amosun's 'consensus' candidates for the governorship election (Akinlade) and state assembly elections are contesting under the banner of APM.